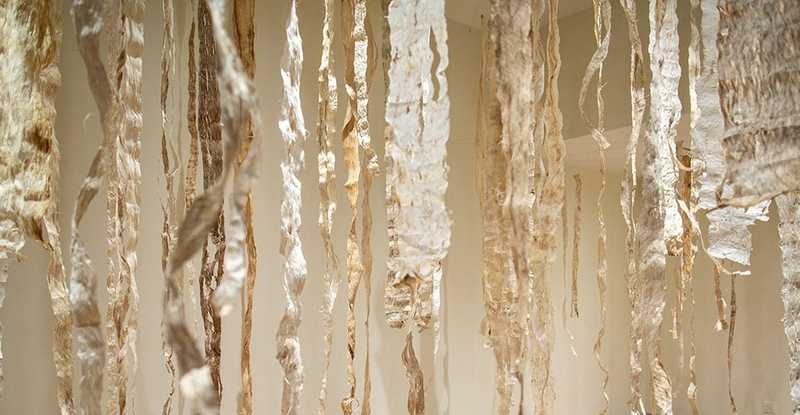 Mixed media artist Maile Andrade transforms the John Dominis and Patches Damon Holt Arts of Hawaiʻi Gallery using wauke, or mulberry bark, as her primary material in this solo exhibition. Andrade’s studio practice is informed by her time spent researching and reactivating the kapa-making process. A Hawaiian customary textile of pounded wauke, or mulberry bark, kapa was methodically stretched, sometimes decorated, and often layered to function as garments, wraps, and blankets before the introduction of cotton fabrics. In the 19th century, kapa production waned as the Native Hawaiian population drastically decreased. However, a cultural resurgence during the 1970s Hawaiian Renaissance revived ancient practices such as ocean navigation by the stars, hula, oli (chant), and mele (music). Kapa-making, weaving, and the growing and gathering of organic materials surfaced as important artistic pursuits—and as pro-Hawaiʻi political statements. A decade later in 1981, Andrade joined the contemporary artists and practitioners who took up the production of Hawaiian material culture using customary methods as an extension of the Hawaiian Renaissance. Andrade channels the material and methods of kapa into an immersive installation as she reimagines the elemental manifestations of Hina. A divine kapa-maker, the Goddess Hina produced such fine kapa that the clouds in the sky were described as examples of her work. Andrade’s gallery installation concentrates on the idea that, like Hina, we have the ability to affect change within our environment. Ka ‘Opua Ā Hina features wauke pounded by the artist to the moʻomoʻo phase. That is, the material has undergone preliminary rounds of soaking, felting, and drying, priming it for handling yet keeping it flexible enough to continue into the later stages of kapa production post-exhibition. Resourceful and sustainable, Andrade’s practice merges 21st century contemporary art priorities with the radical possibilities of Hawaiian material culture. Four kapa dating to the 18th and 19th centuries from our collection are on view in adjacent galleries. Together with Andrade’s installation, these textiles span a period of 200 years and indicate the continuity and evolutionary use of wauke.